Fave 3 Keto Products of the Week! I'm still on a roll with my Keto Diet! Scroll down to see my final weigh in this week! Breakfast: I'm convinced that my Keto Coffee is the key to my success. I know a lot of other people on Keto Diets who make the mistake of not including this in their daily routine and unfortunately they don't have the same results as I do. I start every morning with a KETO Coffee. Click here for the one I use. Consider investing in a 4-pack - you'll save money and won't ever be missing it! If you're like me and add cream to your coffee, I recommend the KETO Creamer as well! It's delish and will help jumpstart your Keto Diet efforts. - Lettuce Egg McMuffin: Bacon, friend egg, tomato, mayo between 2 pieces of boston lettuce or ice berg lettuce! - Yogurt & Chia Seeds: 1/2 cup of yogurt with 1 tbs of chia seeds (let soak overnight in the fridge). In the morning, add a few berries to your container and you're good to go! ** TIP: if you eat breakfast at work, add frozen berries to your container and they will have thawed by the time you go to eat them - they will also help keep your yogurt cold. Getting in my daily dose of Greens isn't easy, so this week I started implementing Greens On The Go at lunch. It's a super quick and easy way to get your vitamins and minerals... just empty one packet into a glass of water and you're good to go! - Fried Chicken Salad: I try the chicken in Avocado Oil for my fat content and add to a salad with a high fat content (like ranch or creamy cucumber) and add cheese, veggies and sometimes bacon! - Steak and avocado: You can add a scoop of tzaziki or horse raddish for the steak and the avocado will help you get in your fat content for the day! - Buffalo Chicken and Avocado: Coat your chicken in cajun spice, fry in avocado oil and VOILA! - BLT with Turkey on a lettuce "bun"
- Veal asian lettuce wraps: use soya sauce, fish sauce, carrots and onions to season the veal and add a bit of avocado oil. You can top with sour cream and srirasha. 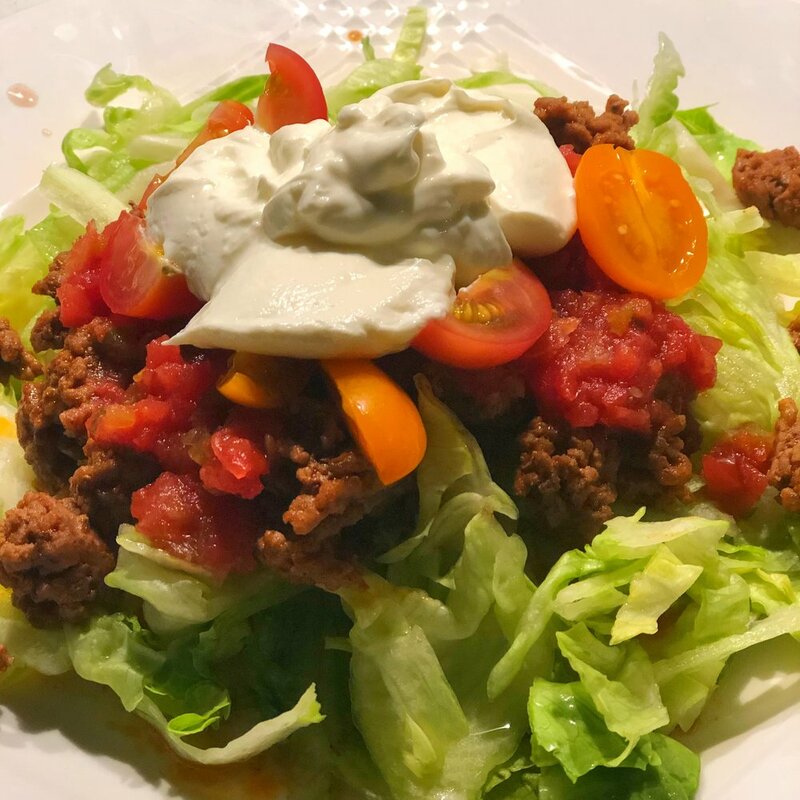 - Taco bowl: ground beef, tomato, cheddar cheese, lettuce, avocado, sour cream and salsa. I am thrilled with my results. Over 7 more pounds lost this week which brings my total since I started 2 weeks ago to 13.9lbs!